The title really speaks for its self. This stuff is to DIE for. Seriously, be careful--once you buy this, give yourself one taste and be prepared to step into a new addiction. I love this item so much, I limit myself on buying it. Once I open this tantelzing jar, I give myself 3 days before I find myself scraping the bottom. Go ahead, give this a try. 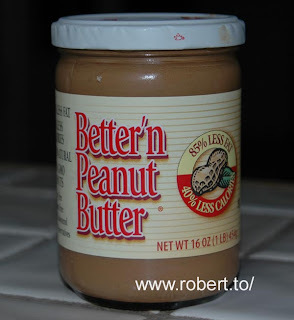 I think the stats are something to be addicted to in itself :85% less fat and 40% less calories than regular peanut butter. I'm not trying to suggest giving you a new addiction, but I do think this needs to given at least a taste. Okay, call me skinny, but I'm heading to Trader Joe's right now to buy a jar.